Amazing Spider-Man #129 CGC 9.0. 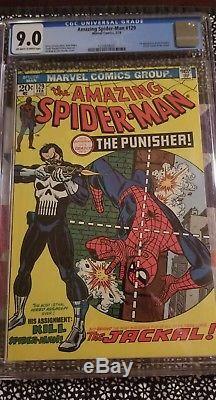 1st appearance of The Punisher (Frank Castle). 1st appearance of The Jackal. Case is in pristine condition with no cracks or scratches. The item "Amazing Spider-Man #129 Cgc 9.0! No Reserve" is in sale since Tuesday, July 10, 2018. This item is in the category "Collectibles\Comics\Bronze Age (1970-83)\Superhero\Spider-Man". The seller is "negler0213" and is located in Mesa, Arizona. This item can be shipped to United States, Canada, United Kingdom, Denmark, Romania, Slovakia, Bulgaria, Czech republic, Finland, Hungary, Latvia, Lithuania, Malta, Estonia, Australia, Greece, Portugal, Cyprus, Slovenia, Japan, China, Sweden, South Korea, Indonesia, Taiwan, South africa, Thailand, Belgium, France, Hong Kong, Ireland, Netherlands, Poland, Spain, Italy, Germany, Austria, Israel, Mexico, New Zealand, Singapore, Switzerland, Norway, Saudi arabia, Ukraine, United arab emirates, Qatar, Kuwait, Bahrain, Croatia, Malaysia, Brazil, Chile, Colombia, Costa rica, Panama, Trinidad and tobago, Guatemala, El salvador, Honduras, Jamaica.